This superb luxury "home from home" hotel is the quintessential location for discerning guests accustomed to the finer pleasures of life. Exquisite meals created by acclaimed chefs are displayed to perfection on china, silver and crystal. Ellerman House has two of the finest collections of South African original art and vintage wines - each individually selected to enhance our guest's experience. Ellerman House was recently honoured by two prestigious publications, Condé Nast Traveller and The Independent newspaper. The Gold List 2010, the annual Condé Nast guide to the world’s greatest hotels, acknowledged Ellerman House in the category ‘Best Hotels for Service’ among only three establishments in Africa, the Middle East and Indian Ocean. The Independent recognised us in an article titled ‘The Big Six: Hotels with Art Collections’. Ellerman House took its place alongside other legendary hotels in this regard – The Ritz-Carlton in Singapore, Gramercy Park in New York, St James’s Club and Hotel in London, The Cullen in Melbourne and La Colombe d’Or in Provence. We pride ourselves on our personalised and distinctive style of service and are therefore gratified to learn that we remain loyal to the Relais & Chateaux motto ‘All around the world, Unique in the World’. Click here for the original Condé Nast Traveller article. 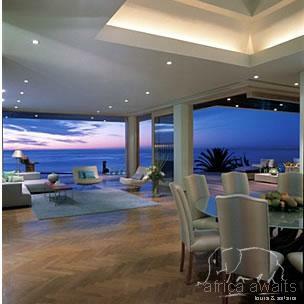 At Ellerman House, guests can relax in the many living rooms that flow onto sweeping verandas and patios. One on the finest collections of original South African art adorn the walls of the hotel and guests are encouraged to linger awhile to appreciate South Africa's finest artworks. The large heated swimming pool is set amid unrivalled lawned terraces with tall palm trees and provides one of the most perfect and unique vantage points imaginable. The fully equipped gym and sauna add to the luxury and convenience of Ellerman House. What better way to tone the body surrounded by Ellerman House's breathtaking views of the Atlantic Ocean. Relax in the stately library and browse the collection of old, rare and new volumes from the Owners' own library collections. Computing equipment is provided to download e-mails and for Internet usage. 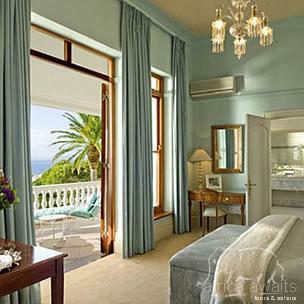 Ellerman House offers luxurious accommodation in Bantry Bay with all deluxe bedrooms and luxury suites, designer furnished and individually decorated. Ellerman Villa: Slick modernity coupled with incredibly comfortable design principles is the ethos behind the newly created Villa & Spa at Ellerman House. Situated in the gardens of the world-renowned Ellerman House, the 'twelfth room' of the hotel was fashioned to offer a contemporary edge to the classic original, without compromising on the philosophy of service excellence. It even has its own butler to cater to guests' every whim. A polished teak deck leads to the Spa with its contrasting pale oak floors and dark wood inlays. The Spa has two bedrooms that can be used either by residents using the Spa, or reserved for sole use by those staying in The Villa, offering five bedrooms in all. A lift, like a modern gilded cage, connects all levels of the house. A curved staircase, the rail bound in leather, follows the lift while soaring, bronzed bamboo delivers a natural art form to complement the space. The living area is open plan and flows outdoors. The massive glass windows peel back completely, opening up the lounge, dining room and study to the magnificent views of the ocean. A separate entertainment room, with flat screen plasma television, DVDs and CDs downloaded into the house's main server, leads into a hi tech stainless steel kitchen, fully stocked with delicacies from the best gourmet food shops in the city. At the top of the house, level with the tree tops, are three luxurious bedrooms each with a glamorous, Hollywood-style bathroom created with acres of Travertine marble, infinity mirrors, some of them etched with ethereal designs, and of course, top of the range beauty products. The main bedroom, with a king-size bed, is decorated in a symphony in aqua and cool creams, and is defined by a bathroom that opens out on to the sea as if someone were on the deck of a boat. The second bedroom, known as the lilac room, is also dominated by a king-size bed, and has a striking Bali-style bathroom. The third bedroom, on the side of the house, looks on to the Twelve Apostles Mountains and has two single beds, both draped in plush burgundy and pale gold. 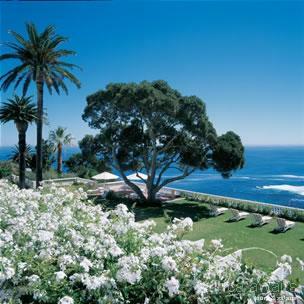 With your holiday, safari or business trip from in to Ellerman House in Cape Town.